Onchorynchus mykiss is a mouthful in more ways than one. It is tricky to say, and it tastes delicious! It’s also a fish that is very rarely seen in the viewing window of the fish ladder. 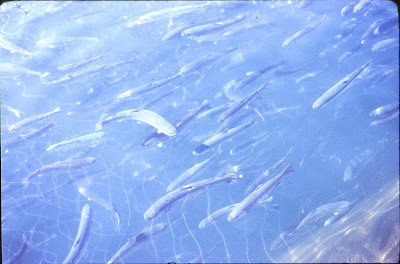 At one time there were two to three thousand steelhead migrating through the Chittenden Locks in winter. Nowadays you are quite lucky to see just one! 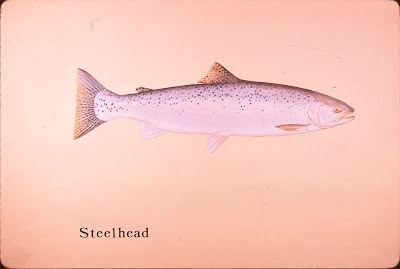 Steelhead are a type of Pacific salmon. Like other Pacific salmon, they rear in fresh water until they become smolts, then migrate to the ocean. This stage can last anywhere from about one to four years. Once in the ocean, they can travel thousands of miles; they keep getting larger as they find larger food sources, usually in colder waters. This stage can also last from one to four years. Upon returning to their native streams, they will deposit eggs. Unlike their cousins the Coho, Chinook, Sockeye, Chum, and Pink salmons, the Steelhead are not always destined to die after they spawn; they may return to the ocean several times in their lives. In that way they are more similar to their distant cousins the Atlantic salmon. Steelhead are quite difficult to track, but some have been tagged and are known to have traveled all the way from the Columbia River basin to the Sea of Japan and back, in their lifetime. 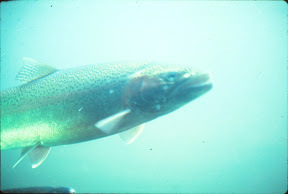 If an Onchorynchus mykiss spends its entire life in fresh water, it is called a Rainbow Trout. They are the same species, but have differing lifestyles. Steelhead normally weigh about 8-11 pounds, but can get as hefty as 40 pounds or more. They are quite silvery in color, with many spots on all parts of their bodies, and a reddish or rainbow hue along their sides. The run of Steelhead that came through the locks was a winter run and was therefore fully mature when they returned upstream. Summer runs come back younger and stay in the rivers until they mature. So, What Happened to the Steelhead at the Locks? The numbers of Steelhead have gone from about 2600 in 1983 to less than 10 in more recent years. It is difficult to get any numbers after 2008, when four fish were counted in the rivers that feed into Lake Washington. At that time only two redds were found; a redd is a nest with eggs in it. The numbers of these fish in the Lake Washington system are so low that they seem to be on the verge of extinction. With that said, a few are seen every year and there are probably some that pass through without being seen or identified at all. There are many factors that have contributed to their decline, such as destruction of habitat, pollution, man-made obstacles such as dams, ocean conditions and over-harvesting. It is also possible that some have decided to remain in fresh water and essentially convert to their Rainbow Trout mode. We also know that Steelhead prefer a fast, cold river to breed and rear in. Unfortunately, the water above the Locks is warmer than it was at one time, due to the urbanization of the environment. Of all the factors have affected the Steelhead, none is as obvious and dramatic as the yearly visitation of the California sea lions. The most famous of these hungry predators was called Herschel. He arrived in 1983 and discovered that steelhead were pretty easy pickings at the Locks. That was when the steelhead run first began to decline. Herschel, and other large male sea lions voraciously ate over half of the returning steelhead that returned to the locks for several years in a row. Although there were often as many as 40 or more sea lions in the area, it was observed that most of the devastation was usually caused by two or three of the largest ones. While the steelhead counts have continued to decline, the sea lion counts have been growing. In 1972 the Marine Mammal Protection Act was first enacted. Since that protection was put in place, the number of California sea lions increased from around 50,000 to around 250,000. Each year shows a small percentage of increased population growth. Numerous methods were employed to deter these Pinnipeds, (fin-footed mammals), but nothing was very effective. Some of the techniques used were underwater firecrackers, known as seal bombs; rubber bullets; acoustic harassment devices; nets; and poisoned fish. The sea lions were also trucked several times to other areas as far away as California, but always swam back. At best, these methods slowed the sea lions down, but not for long. Each time, they got wiser and more sure of themselves. Meanwhile, the steelhead run has not been able to recover. The original run was a wild run; at one point a hatchery run was introduced with the hope of enhancing the numbers. Unfortunately, they competed with the wild fish instead. There is no easy answer to this steelhead situation. What will become of the once wild steelhead run in Lake Washington? If a run still exists will it ever grow? Perhaps, we will have to go elsewhere to celebrate this beautiful fish, our state fish.